*Giveaway extended to June 12th! CaseApp is an online tool that lets you create custom designed cases for your phone, ipad and skin for your laptop. Pretty cool idea right? I love funky and fun phone cases! I don't even know how many I have. I don't want to admit, but I know I have too many. However, I've never bought custom case before. Actually I didn't even know you can do that. So when CaseApp reached out to me and asked if I will be interested for complimentary custom cases, I said, "Yes!" Choose what device you have. Upload the image. Choose if you want the image to be matte or glossy. I suggest uploading a high resolution image. For iPhones you can choose extra protection hard case (I did) and it's working great! My case feels sturdy. You can also choose from their collections and they have a lot of designs to choose from. 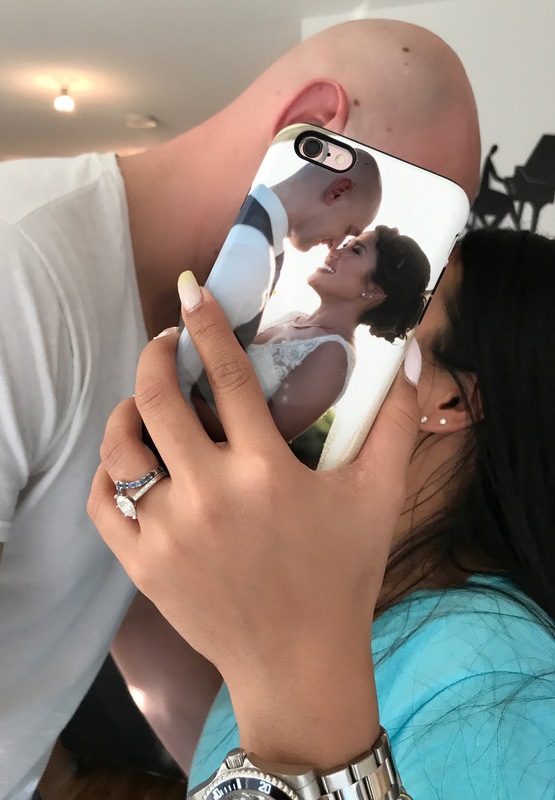 We picked the famous white marble case for my husband's phone. (By the way calling him "husband" still sounds weird. Lol!) His case doesn't feel as sturdy as mine, but I am clumsier than him so I need a little more protection. Now the question, will I recommend CaseApp? If you want personalized phone cases, yes absolutely! Especially if you have an iPhone, make sure to get the extra protection hard case. The ordering process is easy. The quality of printing is also really good. And on that note, CaseApp would like to give one of my readers a free case! How exciting?! All you have to do is follow us on instagram VancityNBeyond and CaseApp. Once done, let us know on the comment box below. Giveway ends on June 11, 2017. Winner will be contacted directly via Instagram DM. Good luck! If you would like to purchase a case now, here's a discount code you can use to save 20% off "VANCITYNBEYOND20". Thank you and see you again on my next post! "We try to hide our feelings, but we forgot that our eyes speak." A week ago today, I got my lashes done at Joanna Keller Beautique. This little hidden gem is located in the trendy neighbourhood of Gastown, Vancouver. The main area where all the magic happens has this very cool mural of woman on the wall. Whoever made it, *hands down*. I love long lashes and I totally agree that lashes make everything better. If you've known me for a while, you can count with your fingers how many times you've seen me without falsies or eyelash extensions. My lashes are pretty decent in terms of length, but no matter how many times I curl them, they don't curled as much as I want to and they are not as full as having falsies or extensions. So when Joanna asked if I want to get my lashes done by one of her techs, I said "of course!" I've known Joanna for a few years now and it was love at first sight. I swear Joanna and her team are one of the best lash techs in town. Here is Lexi working her magic on me. Lexi is very professional, super sweet and funny. And to boot, she also has an amazing fashion style. Just look at that hair. So pretty! Lying down in the same position for 2.5 hours was not easy, but Lexi made it comfortable for me. Her hands were very light, I didn't even feel anything. She glued from 2-10 tiny fans on each of my natural lashes, (this service is called Megavolume full set), using 0.03 mm C curls, length from 9mm - 13mm. Crazy right?! But hey my lashes look fabulous!!! I've been singing "I woke up like this" every single day since (no joke!). It makes getting ready in the morning so much easier. I can sleep in a little, because I don't need to do my lashes. Heck, I don't even need makeup! At the end of my appointment, Lexi gave me a mascara wand applicator to take home. I use it to brush my lashes. Do not get them wet for the first 24 hours. If you can go longer even better. Avoid humid environments like steam rooms and saunas for at least 2 days. Do not pull lashes or rub eyes. Do not use oil-based makeup or makeup remover. Proper hygiene is very important. Wash them regularly after the first 24 hours. Let them air dry or you can also blowdry them with the cool and lowest setting. Avoid sleeping on your face and try sleeping on your back. Before I forgot, my nails were done by my favourite nail tech Nails By Yana. She's amazing! My favourite from this set is the Shiseido Ibuki Smart Filtering Smoother. They sent me the FULL Size! Woot woot! This product really helps with making my skin look smoother and keeping my makeup intact throughout the day. Selfie game is strong! lol Although, for me it works better with medium coverage foundation. I find if I used it with full coverage foundation it looked a little cakey. It also worked great without makeup. Blurs out imperfections and my face is mattified all day long. I tried it with my BB cream too, but it didn't work that well. It kinda looked like my face was peeling. But then maybe it was just my BB cream. Again, all opinions are my own and it could be different for every person. I suggest asking for samples at Sephora or any other beauty stores and give it a try before committing to a full size. Will I purchase it for myself? Yes absolutely! I believe this product will be perfect for summer. I cannot wait for warmer days and not needing to wear makeup! 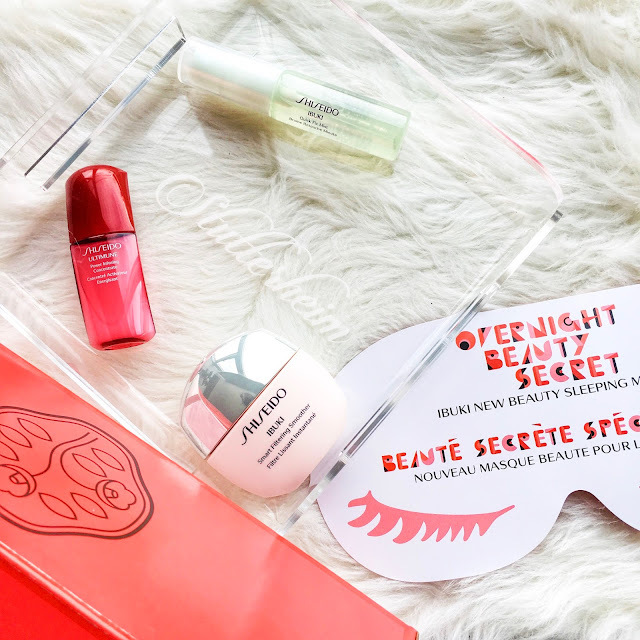 Another one of my favourite from this set is the Shiseido Ibuki Beauty Sleeping Mask. I love the smell and texture of this mask. It wasn't greasy and heavy at all. After using it on the first night, I noticed my skin was radiant and looked fresh the next day. To think I went to bed pretty late. Like 3AM?! Lol I'm thinking of adding this to my nightly routine. I haven't really tried the other 2 products. I tried spraying the Shiseido Ibuki Quick Fix Mist, it was refreshing and absorbs quickly, but the pump doesn't spray even mist. It definitely needs improvement. I will transfer it in a different bottle and update everyone on my Instagram.